Red Dead Redemption II is the latest installment in Rockstar’s western shooter series. It is a first/third person shooter with rpg elements featuring cool characters, guns, open world, and suspenseful storytelling. Released Date: Oct. 26th, 2018. Update! Red Dead Online is now in open live beta! Red Dead Redemption 2 includes many people, from rival gangs to lawmen. Each town has many patrons. Many characters are in the Van Der Linde gang, as in the following people. RDR2 takes place before the events of the Red Dead Redemption 1, but after Red Dead Revolver. It is 1899, the end of the century, along with the wild west. The player plays as Arthur Morgan, a member of the infamous Van Der Linde gang. 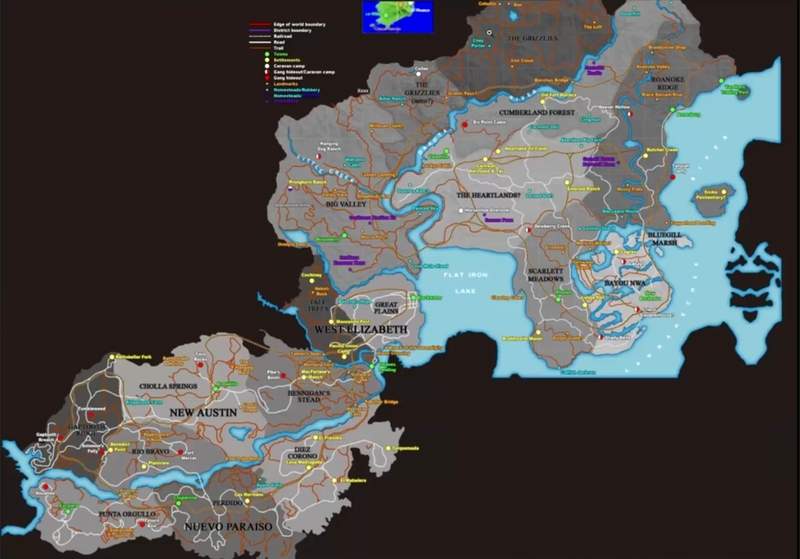 With a huge open world, RDR2 contains states, frontiers, towns, settlements, and many bodies of water, from lakes, rivers, to the coast. Here are some of the known waters in-game. Weapons are a key for survival in RDR2. The wild west is full of deadly predators, human and animal alike. Carrying a couple of guns and knives is key to staying alive. But make sure you got ammo and your weapons are in good condition. 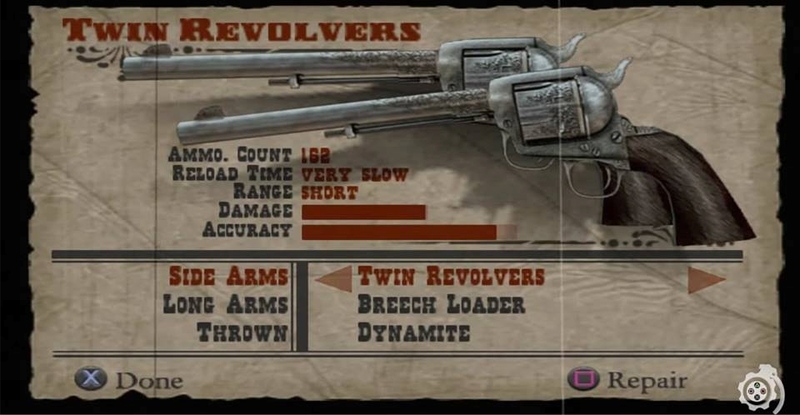 The weapon system said to be realistic, and similar to the one in the original Read Dead Redemption. Dead Eye system is in this game. Red Dead Redemption 2 has a living world featuring 200 species of wild life, along with rare unique animals. Hunting and fishing are a major function of the game. Horses are a necessity for any accomplish cowboy or outlaw. There are 19 different horse breeds in Red Dead Redemption 2, with 59 different coat designs. Horses allow for transportation and also carrying objects and weapons. There are different breeds for different styles and play. Bonding with horses is important for progressive controls and action. I am a bit hoping this game has bit of a Grand Theft Horse feel. Legendary animals are found in the wild much like other Rockstar games.For each one of the 200 species it is said that there is one legendary. Hunting legandary animals awards unique pelts and such for crafting one of a kind items. Legendary animals outside of the species, and others such as Bigfoot and Chupacabra are yet to be confirmed wither way. The dead eye system allows for more accurate shots by slowing time and showing vital target areas. Dead eye is great for shoot outs, but could also be used for accurate hunting. Save the skin of meat of your prey with one shot kills. Your actions, such as decisions and kill count, effect how people in the game see you. Keep supplies and resources plentiful to keep the gang morale high, giving you more rewards and perks. Rockstar is ambitiously pushing to make RDR2 one of the most lively open world games to date. They are doing this by having time and environment being a major factor to gameplay. Your character must eat, rest, shave, and so on. At the same time, everything you do may leave a mark in the world, for better or worse. Red Dead Redemption 2’s online will release one month after the initial game launch date, Oct. 26th. Online will release first as a beta, and will allow around up to 32 players on one map.